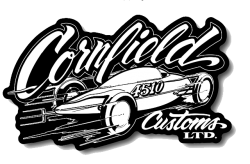 Cornfield Customs is a home grown Hot Rod shop that prides it self in a high quality of craftsmanship. We can take your Hot Rod dreams and make them a reality. We appreciate you taking time to look at our site and see what we eat, sleep and breathe….. quality built hot rods at a reasonable price. If you have any questions , comments, or concerns with any thing you see or read, feel free to contact us at any time. Owner/ Operator, Cornfield Customs Ltd.